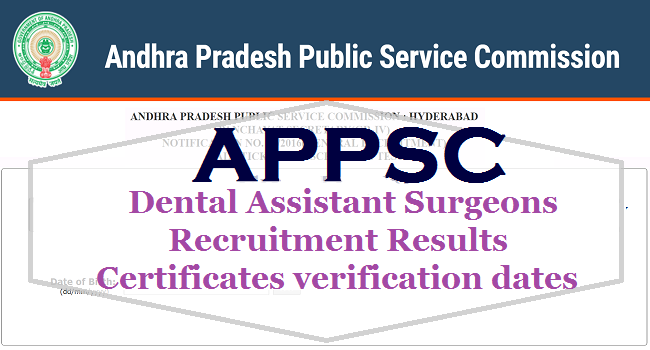 APPSC Dental Assistant Surgeons Recruitment Results Declared, APPSC Dental Assistant Surgeons Recruitment Results, Certificates verification dates 2017: Andhra Pradesh Public Service Commission (APPSC) has declared the result for the written exam held for the post of Dental Assistant Surgeons in A.P. INSURANCE MEDICAL SERVICES. Candidates who have qualified the written exam have been provisionally picked by the Commission for Certificates verification. APPSC Dental Assistant Surgeons Recruitment Results notification: It is hereby notified that on the basis of the Written (Online) Examination held on 07/02/2017 FN & AN and 08/02/2017 FN at 13 districts of Andhra Pradesh and Hyderabad in Telangana State to the post of Dental Assistant Surgeons in A.P.I.M.S. vide notification no: 07/2016, Dt: 30.09.2016, the candidates with the following Register Numbers have been provisionally admitted for verification of original certificates in terms and conditions of Notification. The list is prepared on 1:2 ratio considering category wise merit. If any category the available posts are filled even before the list is exhausted, further verification will not be done. The verification of Original Certificates to be held on 01/05/2017 at 11.00 A.M. in the Commission’s Office, Prathibha Bhavan, M.J. Road, Nampally, Hyderabad-500001. Out of the above list, if required candidates do not turn up for verification in any category candidates next in merit list will be called. The result copy can also be seen in the Commission’s Notice Board. Dt: 04.04.2006 read with G.O.Ms.No.26, BC Welfare (C) Dept., Dt: 09.12.2013, P.H. (OH) Certificate in case of disabled candidates and migration certificates for candidates who migrated from Telangana to Andhra Pradesh etc., at the time of verification of Certificates, failing which, they will not be treated as eligible with reference to the particulars furnished by him / her in the online application form / Certificates. The results of such candidate (s) shall be cancelled at any stage in the process of selection. The Commission has the right to disqualify any candidate, if he / she is not found eligible for any reason. 2 revised Attestation forms from the commission’s website www.psc.ap.gov.in. The individual call letters will be sent to the candidates. In case he / she has not received the call letter (memo), attend to certificate verification as per the date mentioned in the verification schedule. Marks lists of all candidates who appeared in the written (online) examination is also available on website.